DHDC Youth Staff plan the Summer Youth Camp Fundraiser Series, which consists of two events in the summer to help raise funds to take participants in our Summer Youth Program to a campsite in Michigan for a few days. For many of our participants, this opportunity is the only chance they get to leave Detroit and spend quality time with friends in nature. Youth Staff see this opportunity as a chance to solidify their relationships with the youth, as well as one when the youth can apply their leadership and personal development skills in an outside venue. 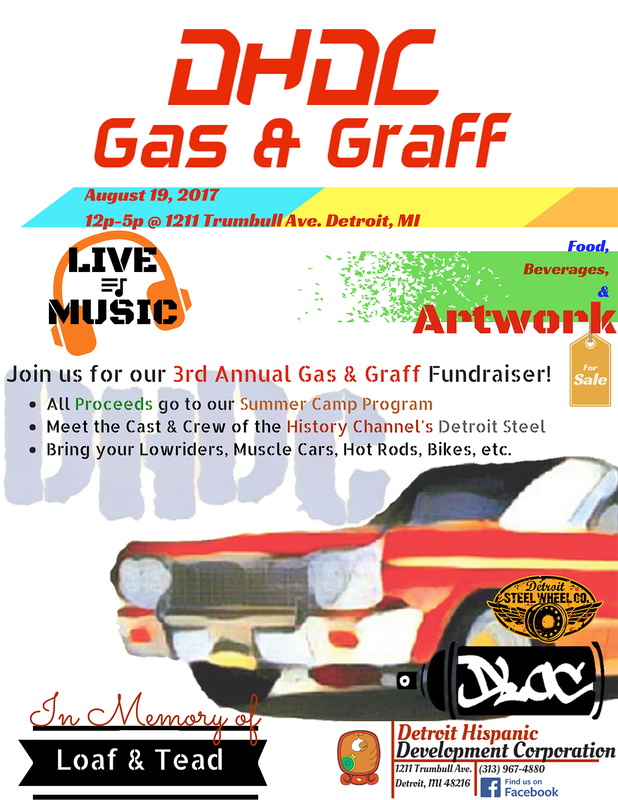 We will kick off this series with our Gaz and Grafz event, which is a graffiti art show and a car show, with live performances from The Raiz Up on Saturday, August 19th, 2017 from 12pm-6pm. This family-friendly event will have free admission with food and drinks for sale. The event will take place at Detroit Hispanic Development Corporation in Detroit 1211 Trumbull. f you have any questions, please contact Victor Tavares at (313) 967-4880 or vtavares@dhdc1.org. Please join us for both events and support Southwest Detroit by helping give Detroit youth an opportunity like none other this summer! Help us gather online support by using the hashtags #amoDHDC and #getuptogetdown! "The staff was very cordial, respectful, and helpful...which was opposite from what I was used to. From this program I got the willingness to do and not give up."